This article describes how Kansas schools had begun?and in some cases completed?the process of desegregation after the Supreme Court case Brown v. Board declared that segregated educational facilities were unconstitutional. Lawrence, Salina, and Atchison had completed integration, while Wichita, Kansas City, and Topeka were still in the process of implementing their plans. 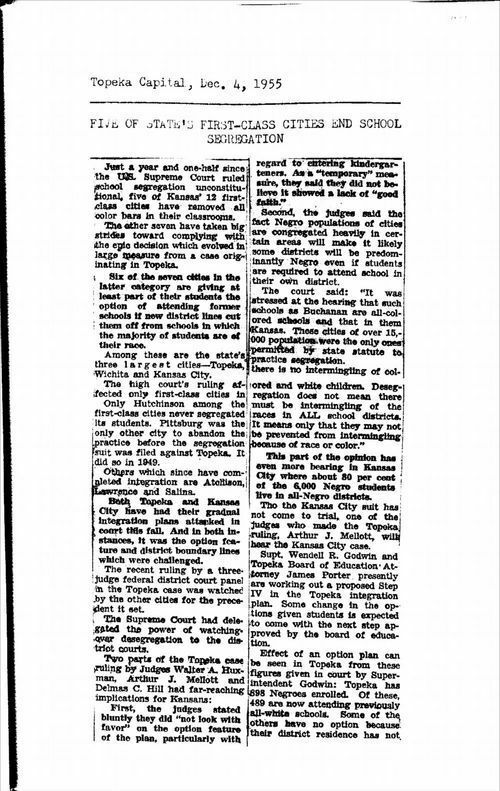 In some cases the integration plans were attacked; for instance, in Topeka, students were allowed to continue attending their old school through the sixth grade, a move that some believed was simply reinforcing segregation. Prior to the Brown decision in 1954, only cities with populations over 15,000 ("first-class" cities) were allowed to have segregated grade schools, and some towns, like Pittsburg, had abolished segregated schools before the Brown case.